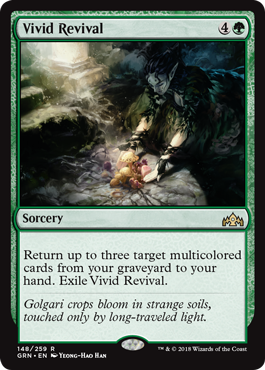 I smell a win condition for a sweet deck here, as Vivid Renewal will seal the deal if you can get the full three cards back (and aren’t dead on board). I like cards like this, and feel that they are usually worth building towards. Here, I’d look to be a 3-color deck, though if the cards are flowing you may be able to pull this off with just one guild.